Tony Blair has branded Tory leader David Cameron a "flyweight" who faces electoral knockout by the "big clunking fist" of a Labour "heavyweight". His words, as the pair clashed over Mr Blair's plans for his last year as prime minister, were taken as an apparent endorsement of Gordon Brown. 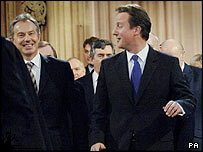 Mr Cameron accused Mr Blair of running "a tired and discredited" government. 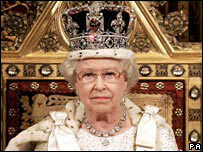 He said the 29 bills in the Queen's Speech, focused on crime and security, peddled the "politics of fear". The Tory leader told MPs it had all been heard before, saying: "The tragedy of this prime minister is that he promised so much and he has delivered so little." He said the package of plans was "not about keeping hospitals open or keeping the streets safe, it's about keeping a tired and discredited Labour Party in power, and the truth is they've failed to deliver". Mr Blair, responding, denied using the "politics of fear," saying the government had made a "realistic assessment of the threat and the measures to meet it". On anti-social behaviour, Mr Blair said the Tories were "completely out of touch with the needs of people in this country". Mr Blair ended his repsonse by saying the next election contest would be "a flyweight versus a heavyweight". "However much he dances around the ring beforehand he will come in reach of a big clunking fist and, you know what, he'll be out on his feet, carried out of the ring," Mr Blair told the Tory leader before getting a pat on the back from Mr Brown when he sat down. In his response the Queen's Speech, Liberal Democrat leader Sir Menzies Campbell accused Mr Blair of being too keen to introduce new laws. He also attacked the government over Iraq and what he called Mr Blair's "apparently uncritical acceptance of a US strategy which has self-evidently failed". Analysis: Will it outlast PM? Calling for a phased withdrawal of troops, Sir Menzies said the government had "no right" to ask service people to risk their lives "if there is no realistic chance of success". The details of the government's priorities were earlier set out in Parliament by the Queen amid the traditional pomp and ceremony. Crime, security and anti-social behaviour took centre stage but tackling climate change and reforming pensions were also highlighted as key priorities for the coming Parliamentary session. There will also be moves to strengthen border controls, prevent illegal working and push ahead with ID cards. The government says it will push ahead with longer-term plans to implement the Turner report on pensions. These include restoring the link with earnings - a move welcomed by the Conservatives. On the environment, the government will commit itself by law to a long-term goal of a 60% cut in carbon emission by 2050 and an independent panel to monitor progress. But Mr Blair rejected Conservative calls for annual targets, saying a "colder than usual winter" or a drop in fuel prices could wreck them. He also accused Mr Cameron of "sitting on the fence" over nuclear power, with the prime minister saying it was necessary to help cut carbon emissions. On Lords reform, ministers pledge to continue seeking a cross-party consensus before coming up with new legislation. But they remain committed to abolishing the remaining hereditary peers and holding a free vote on the composition of the second chamber. As in recent years, the Home Office that will have the heaviest workload, with eight separate bills referred to in the programme. Sentencing reforms could see criminals caught red-handed lose the right to have their sentences cut by a third if they plead guilty, and tougher sentences for violent prisoners. The immigration measures are expected to put into practice the plans unveiled in the summer for tighter immigration controls and firmer action against employers who use illegal immigrant labour. On terrorism, no new bills were unveiled but the government said it would legislate to fill the "gaps" identified by Home Secretary John Reid's review of current capabilities and resources, "taking into account lessons learned" from the alleged airline terror plot last summer. Some ministers are said to be in favour of a new attempt to allow the detention of terrorism suspects for up to 90 days, before they are charged. The session is scheduled to last until next November, and as Mr Blair has said he will stand down by next September, it will be his last one in office.